Stalking Darkness is the continuation of Lynn Flewelling’s Luck In The Shadows; these two books are clearly meant to be read together. 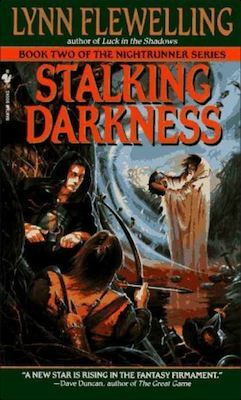 The book picks up where the other one left off: Seregil is helping Nysander with his very secret mission, yet still doesn’t know exactly why and what he is risking his life for. Again like it’s predecessor this book is very character driven, focusing mainly on the friendship between Alec and Seregil, and the other characters. Slowly the relationship between the two main characters evolves into something more, and while not every reader might like this development, I adore the way Alec and Seregil interact with each other. My only annoyance with this book was when I read it the first time, I was expecting this to be a trilogy. I thought the third book would finish the main story line, but it doesn’t. The main plot from the first book is completed in this second one, while the third book is pretty much standalone (still with the same characters). It’s not too much of a complaint; it’s just annoying when you’re expecting one thing, and get something else.